The Honda Civic Type R has broken Renault’s strangehold on the unofficial lap record for a front-wheel drive car around the Nürburgring. 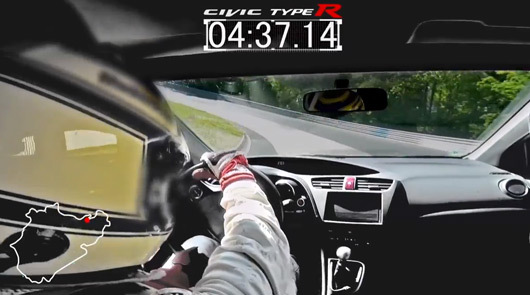 This video shows a development Type R lapping the Ring in 7 minutes 50.63 seconds. Interestingly, the claim was recorded in May 2014, around the same time as Renault took the record back from Seat. It’s amazing that Honda has been able to keep that lap time quiet for so long. News of this lap has been published to coincide with the debut of the production-ready Civic Type R in Geneva this week. Honda says it will send a production Civic Type R back to the Ring with a view to matching or bettering the time achieved by this development model. In the meantime you can checkout the screechy lap record after the break. At the world premiere of its all-new Civic Type R at the 2015 Geneva Motor Show (5 – 15 March; Stand 4250, Hall 4), Honda announced that a development car had achieved a 7 minutes 50.63 seconds lap time of the legendary 20.8 km/12.9 mile Nürburgring Nordschleife in Germany.